It's a simple fact: We live in a toxic environment. The food we eat, the water we drink, the air we breathe, household items we buy and even our dry cleaning are loaded with environmental toxins. To make matters worse, our homes and offices are contaminated from chemical-laden carpeting, furniture, drapes and building materials. Don't eat. Don't drink. Don't breathe. That's the only sure way to avoid dangerous environmental toxins. But how long can you keep that up? Even the most careful and conscientious choices we make can't fully protect us from the cumulative effects of environmental toxins that can rob us of optimum health. But Aulterra Enhance can help. Aulterra is a homeopathically activated combination of natural paramagnetic and diamagnetic elements that neutralize the effect of heavy metals and other toxins on human DNA. Noted DNA researcher Glen Rein recently completed a study in which he was able to ". . . clearly demonstrate the ability of the energy from Aulterra powder to neutralize the toxic effect of copper on human DNA." Each Aulterra capsule contains 500 mg of a proprietary blend of natural rock powders and minerals from a natural mineral deposit from an ancient seabed that provides properties characteristic of a high concentration of naturally occurring monatomic minerals. The suggested dose is two capsules per day, and best results are obtained with continuous use. An important observation recorded by Dr. Curt Grange in "Blood Studies with Aulterra", March 1997, was a dramatic reduction in "sticky blood" or rouleau within 20 minutes of consuming Aulterra Enhanced. This feat required a significantly enhanced oxygenation of red blood cells in the bloodstream. Aulterra stimulates the natural oscillation of DNA — the quantum oscillation effect, a winding and unwinding of the DNA only associate with healthy normally functioning DNA — which enhances DNA's natural intrinsic vibration. Aulterra neutralizes the harmful effects of toxins in the body, including exposure to toxic substances. This is accomplished through electromagnetic dynamics that reverses the negative spin of any toxic substance to positive. Proper balance is important in all aspects of our lives. The proprietary Aulterra formulation is especially well suited to producing a free flow of energy throughout the body to open meridians and chakras for optimum healing and physical and spiritual harmony. 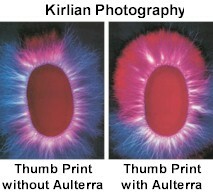 This effect can easily be seen in the Kirlian photography below showing a human thumb before and after taking Aulterra Enhance capsules. Several studies clearly show that the energy of Aulterra neutralizes the negative effects of toxic elements. In 1996, the University of Idaho conducted toxic-soil-recovery studies utilizing Aulterra powder, where samples of soil contaminated with lead and zinc were mixed with small quantities of Aulterra powder. The premix soil contained 200 ppm of lead, and the zinc measured 26.8. Two days after mixing Aulterra into the soil, the lead measured .5 ppm and the zinc measured 6.5 ppm. In 1988, Lockheed Martin conducted another study to determine if Aulterra could neutralize radioactive elements. After six months, Aulterra successfully reduced the gamma radiation of the control substance by 80%. How does Aulterra neutralize radiation and toxic metals? All particles coexist as waves and all waves coexist as particles. Also, it is well known that energy cannot be created or destroyed, but it does change form. It can be said that the subatomic particles that make up the lead and zinc also exist in waveform. In reality, another way of looking at the coexistence of particles and waves is to say that matter oscillates between particle and waveform. This way, depending on the detection technology, energy can be "caught" in either form. In the DNA study, it was shown that Aulterra neutralized the negative effects of copper on DNA. Although the scientific principles of intention and biological information transfer should be identical for any toxic substance, research continues to confirm that Aulterra neutralizes all heavy metals in any biological system. The manufacturer of these exquisite formulations strives to make the very best food supplements available anywhere in the world. This is why, among other processes, they balance and align the energy fields in all their energy-field formulations using Aulterra as the trace mineral catalyst to improve the formula's bioavailability and enhance utilization within your body. No other manufacturer goes to these levels to assure the highest quality and effectiveness possible. It is the way all supplements will be made in the future. Aulterra consists of diamagnetic and paramagnetic elements that have remarkable health benefits. A homeopathic preparation is created from these elements and blended back into the mother substance. Aulterra is created with the intention of restoring harmony into any structure that is not in resonance with its highest good. This intention becomes stored information that can be subsequently retrieved or utilized by biological systems, thereby producing a biological effect. In this sense, these objects have a memory of the information stored within them. Although long-term storage of information in physical objects is considered an anomaly in the eyes of traditional science, it has been demonstrated experimentally. One of the biological targets used in these studies was the DNA molecule. In addition to these responses to stored or imprinted energy, DNA has been shown to act as an antenna for other forms of subtle energy (Rein, 1994, 1996, 1997). Thus, it has been discovered that in addition to classical EM fields (Semin, 1995), subtle energy resonates with the DNA molecule and causes physical changes in its secondary structure (winding and unwinding of the helix). Laboratory studies on Aulterra confirm the following: 1) Aulterra increases the utilization and effectiveness to the body of any substance, including pharmaceuticals, nutraceuticals and herbs, and foodstuff by 30% to 60%, 2) Aulterra stimulates the natural oscillation of DNA, which enhances DNA's natural intrinsic vibration, and 3) Aulterra neutralizes the harmful effects of toxic substances, including toxins in the body. This is accomplished through electromagnetic dynamics that reverses the negative spin of any toxic substance to positive. Making better use of our personal resources is important ... whether that is: 1) making better use of our time so we can accomplish more within a 24-hour time period or having extra time to spend with friends and family, and 2) making better use of energy by becoming energy efficient in our home and workplace. Driving fuel-efficient cars will become more of a necessity than it was in the early 1970s. Aulterra provides the opportunity for us to be more efficient with our most important possession, our body. There is not a scientist, doctor, government official or even a lawyer that would argue with the fact that our food is nutritionally deficient. The demineralization of our soils and the flagrant use of toxic insecticides and chemical fertilizers have reduced the nutritional value of our food by 80% over the last 50 years. This is the main reason why many doctors and health experts all over the world recommend dietary supplements. Additionally, we pay over eight times more today for our nutritionally deficient food than we did twenty years ago. This is primarily due to the flawed agricultural policies of virtually every country on the planet and corporations who put their profits before your well-being and that of our planet. In order to stay healthy, many choose to pay the premium for organic foods, and many more buy dietary supplements believing it is the only answer for any hope of staying healthy in an ever-increasing toxic environment. It seems that the cost of staying healthy is only exceeded by the cost of being sick. With Aulterra, we can enhance the utilization of food and dietary supplements by 30% to 60%. We can either choose to increase the value of our food intake by giving the body more solid nutrition, or we can choose to decrease our consumption, saving money at the food store. It is important to note that these results may only be obtained by sprinkling Aulterra directly on the food or supplemental preparations. All testing was done with Aulterra coming into direct contact with the substance. Taking a capsule with the meal may or may not produce the stated results. For years DNA researchers thought the double helix that holds our genetic code was a stationary structure. Only within the last few years have these same researchers realized that a healthy, normally functioning DNA is in a perpetual oscillating motion of winding and unwinding. DNA unwinds when the hydrogen bonds that hold the helix together are broken by noxious stimuli. As it recovers, it spontaneously rewinds. However, when in an environment of harmonic electromagnetic fields, the unwinding and rewinding become oscillatory in nature. The helix rewinds, and then unwinds a little, rewinds, and unwinds a little. When this oscillatory pattern is a constant, quantum coherence occurs. Aulterra induces this quantum behavior in DNA. "Quantum," as defined in Taber's Cyclopedia Medical Dictionary, is "a unit of radiant energy." Therefore, this quantum behavior produces radiant energy. "Radiant" is defined as "emitting beams of light." Many spiritual visionaries have talked about living in the Light. Indeed, Jesus said, "Ye are the Light of the World." The phrase, "Let there be Light" is used by many religious denominations to foster blessings. Aulterra takes the possibility of "living in the Light" to new and profound realities. Many scientific visionaries have stated that DNA is at the core of our evolutionary destination, especially in these times of extraordinary change. What could be more significant than optimizing DNA function so that the oscillation pattern, which can be activated by Aulterra, becomes the reality of every cell in your body? Would not we live in a constant state of health? Would not we evolve to our highest potential? Most DNA researchers believe so. Shop all Aulterra products by clicking the "Enter store" link.